It's almost time for the NFL Super Bowl XLIX! While it will probably be forever a while before Cleveland gets to watch our Browns play for a title, it's still fun to do something on Game Day. Even if you just get together with friends to watch the advertisements. 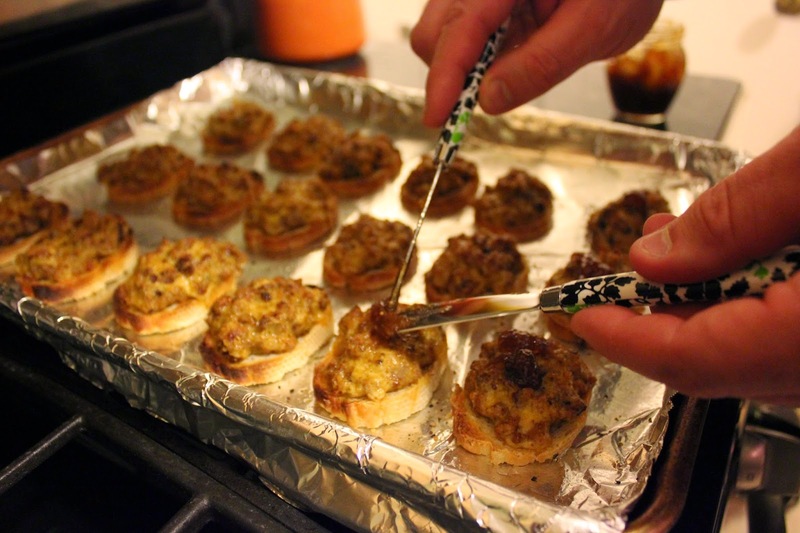 So, Mr. H and I wanted to recreate an appetizer, perfect for Game Day, from our wedding. Hodge's in Downtown Cleveland is famous for their Hanky Pankies, and lucky for us, Driftwood Catering offers them on their catering menu. Our guests were raving about them during our Cocktail Hour at the wedding, and they were certainly our favorite of the four that we served. Pan sear the crumbled chorizo until cooked through. Add the three cheeses and thyme to the pan, and melt. Mix well to create the hanky panky mix. Slice the baguette and spread the slices on a cookie sheet. Spread 1 1/2 Tablespoons of the mix onto each slice. Place the pan under the broiler until browned. 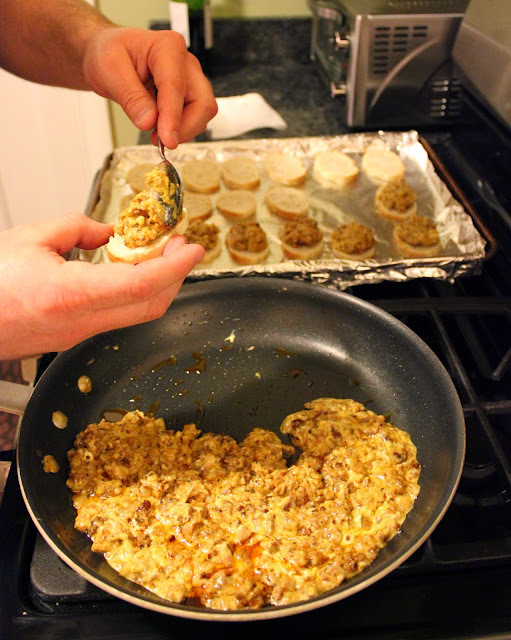 Remove, and top each with 1/2 teaspoon of fig preserves. While they weren't nearly as good as the famous Hodge's version, they were reminiscent and quite tasty. 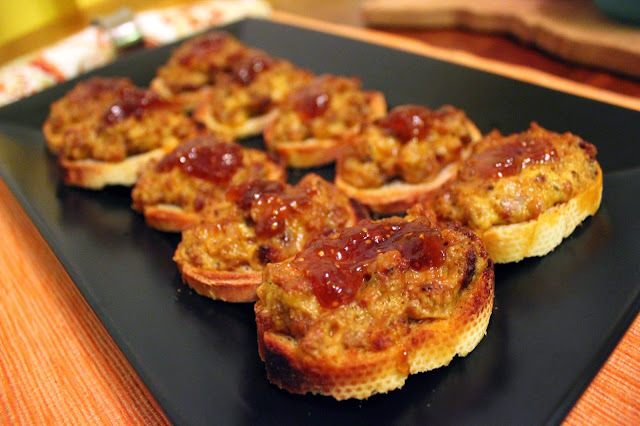 I'd make these again for any type of gathering with family and friends. Enjoy! Mr. H actually selected a restaurant from my 2015 To Dine challenge list for a casual birthday dinner out with his family. I wasn't complaining! It was a brand-spanking-new restaurant, and one that I was very interested to try. We headed to Forage Public House in Lakewood, on a Wednesday. The restaurant and bar weren't too busy that night, but it is a good-sized place thanks to the large wrap-around bar, bar area seating, and a dining room. The six of us were seated at a high-top table in the bar area. The menu is split into two sections, a Build Your Own Burger list of ingredients, and then a section broken down into categories like "Fields" or "Butchers" or "Sea." Personally, I'd like to see them reorganize the menu. Having both appetizers and entrees listed in these categories made it confusing at times. From the price points, it wasn't always easy to tell what the size of the dish would be. If they are set on keeping these categories, at least break it down by starters and entrees within the categories. ...and the Daily Pickled ($5). Both were a nice, light start to the meal, and easy for us all to share. Mr. H ordered the Suckling Pig ($22). I had our server choose between a couple of entrees for me, and he selected the Shortrib ($25) with whipped white hominey and ancho chile jam. The varying textures in Mr. H's dish were great, and it was certainly a decent dish, but the flavor of my dish "won" that evening. It was rich and tender, and I loved the whipped white hominey. I couldn't finish it, but it reheated well for lunch the next day. Others at the table enjoyed burgers, and the Rabbit. Now, Mr. H has actually been back, already! A guys' night out led them there the following week, and he indulged in a burger. The buns are a tad too thick, but otherwise everyone is claiming that Forage is doing a really good burger. With topping options like Foie Gras, Pork Belly, Proscuitto, Pate, Suckling Pig, and Wild Huckleberries, they are certainly offering some of the most unique Build Your Own Burger options that I've seen. The drink menu is solid, with plenty of craft beer choices, wine (half off bottles on Wednesdays), and several tempting cocktails. The atmosphere and food (while a bit elevated) don't feel very different than its sister restaurant, Oak Barrel in Valley View. With other similar, and popular, restaurants close by in Lakewood, they'll need to maintain quality, switch up the menu seasonally, and make a few more improvements and decor additions inside. But, that said, I think that it could do well, based on our two experiences there recently. ...#16, Kayla Grise! Email me by Monday at 4:00pm to claim your prize, or another random winner will be selected. Thank you to Heinen's for sponsoring my Game Day post. I also wanted to share a recent dining experience with you. When we're looking for a special occasion restaurant, there are a few that come to mind. Pier W happens to be one of them. With stunning views of Lake Erie, the cliffs, and the Downtown Cleveland skyline, it just can't be beat. Luckily, the service, food, and drinks live up to the atmosphere and reputation, and we've enjoyed several memorable meals there over the years. Mr. H's birthday was last week, and he select Pier W for his birthday dinner celebration. We went all out, and had a wonderful meal. We started with a Sampler of Oysters ($18 for 8). I love it when you get to try different types of oysters side-by-side, because I just don't know enough about them. They were succulent, and a great start to the meal. We also shared the Calamari Fritti ($12), served with Gremolata, Sriracha Aioli, and Sweet Spicy Tamarind Dip. This was good, but I've had better. Mr. H ordered the Cedar Planked Salmon ($28), and loved it. It was even mild enough for me to enjoy a small bite. I went with the Grilled Hawaiian Big Eye Tuna ($33), served with Chinese Black Rice, Tempura Snowpeas, Bean Sprouts, and a Tamari Glaze. The seared tuna was seasoned and cooked perfectly. I do wish that there had been more than three peas included, and that the dish had a bit more sauce to use with the dry rice, but otherwise, this was a great dish. Pier W surprised us with a complimentary birthday dessert. The vanilla ice cream and homemade whipped cream hit the spot, and it was a thoughtful touch. I had included a note in our OpenTable reservation that it was a birthday celebration. It's nice to know that they pay attention to those comments. One tip: The window tables at Pier W have the best views, and they are first-come first-served. We arrived a half hour early, checked in with the hostess, and then enjoyed a cocktail at the bar while we waited. We were seated right on time for our reservation, and had one of the best booths in the restaurant. Thanks for another memorable special occasion meal, Pier W! What's your go-to restaurant for a celebratory meal? Disclosure: Heinen's provided a $50 gift card to give away to one lucky reader, and a $100 gift card for supplies, in exchange for a recipe and giveaway post. All opinions stated are 100% my own. On Saturday morning, Mr. H and I were on the hunt for a new-to-us diner experience. I'm all for a fancy brunch meal, but sometimes a greasy, classic diner breakfast just hits the spot. We didn't have a destination in mind, and just started driving. You know those places that you drive by frequently, but you've never been into? Well, we finally checked one of those out. To get over to the Detroit Shoreway neighborhood, we often head down Denison Avenue and take 65th Street to cut over. Mom's Family Restaurant has always stuck out as we drove by, and that's exactly where we ended up on Saturday. It's a rather large, brown building on the corner of West 65th Street and Clark Avenue. It has a good-sized parking lot in front of the building, and additional free parking next door. The diner is nothing special to look at inside, but it certainly has that hole-in-the-wall diner charm. Ripped booth seats, cracked ceiling from water damage, wobbly tables...it has it all. We were pleasantly greeted, and encouraged to sit anywhere that we liked. The menu has all of your standard diner breakfast and lunch fare. I decided that I was in the mood for French Toast, so I went with the Rise and Shine. It included French Toast, two eggs cooked my way, bacon, and sausage. Dining Deals Alert! The food was completely acceptable, and fulfilled our desire for a classic diner breakfast. Mr. H even declared his Veggie Omelet as one of the better ones he's had at a local diner. His side of Sausage Gravy was above average in terms of flavor and texture, and his meal overall was really enjoyable. We really only ran into trouble when it came to the drinks. We both ordered coffee and water when we arrived. Man, that was the WORST tasting water that I've ever been served. Now I understand why they have a cooler of $1 bottled water behind the counter. There was no way that I could drink that with my meal, so I ordered a small Orange Juice. Yikes, it wasn't quite as bad as the water, but it was almost un-drinkable as well. It had that fake taste of Tang to it. Based on the drink situation alone, I wouldn't return to this diner. With all of the other options out there, we'll move on to another. Did you watch the Playoff games? I know that Cleveland no longer has a "dog in the fight" with our Browns, but this time of year it is still fun to get involved with Game Day and rooting for a team. Me? I'm always in for some Game Day fun, including tasty share-able foods like dips, sliders, flatbreads, and more. Heinen's also wants you to experience Game Day, by preparing delicious recipes to share at home with family and friends. 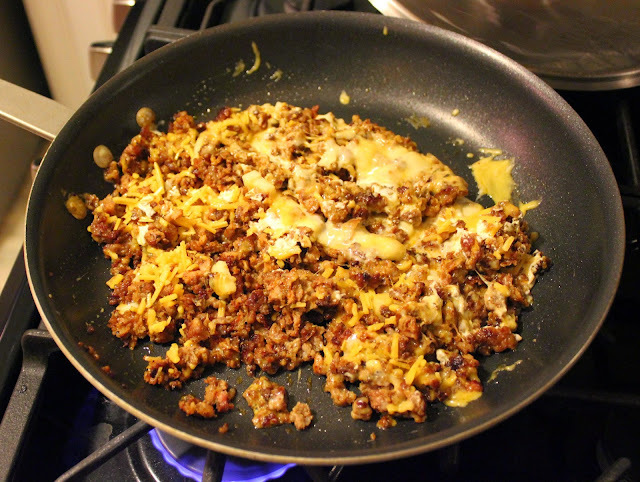 Below is a recipe that we tried recently. You can try this at home, thanks to a $50 Heinen's gift card. See below for details. To prepare for the upcoming big Game Day, here is a recipe adapted from The Slow Roasted Italian. Pour beer into large mixing bowl. Sprinkle yeast over top, add sugar and stir. Allow yeast to bloom for 5-10 minutes. 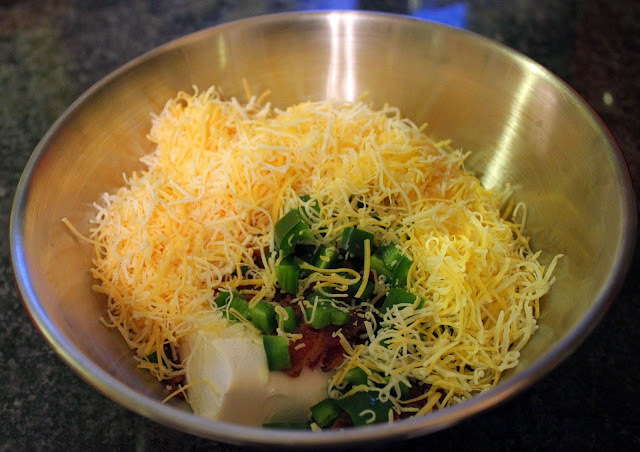 In a medium mixing bowl combine cheeses, bacon and jalapeños. In a small bowl beat egg, set aside. Add flour and salt to yeast. Knead for 3- 5 minutes until the dough comes together in one ball. Add more flour a tablespoon at a time as needed, if bread is too sticky to come together. 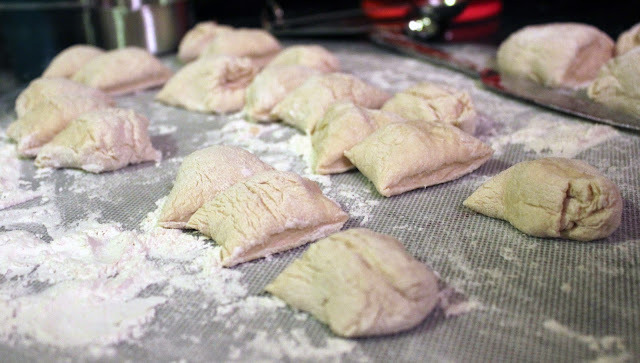 Place dough on floured counter top and knead in flour until it is no longer tacky, just a minute or two. Form dough into a ball. Cut this ball into 12 even pieces. Fill a medium (4 cup) bowl with 2 cups of hot water and add baking soda. 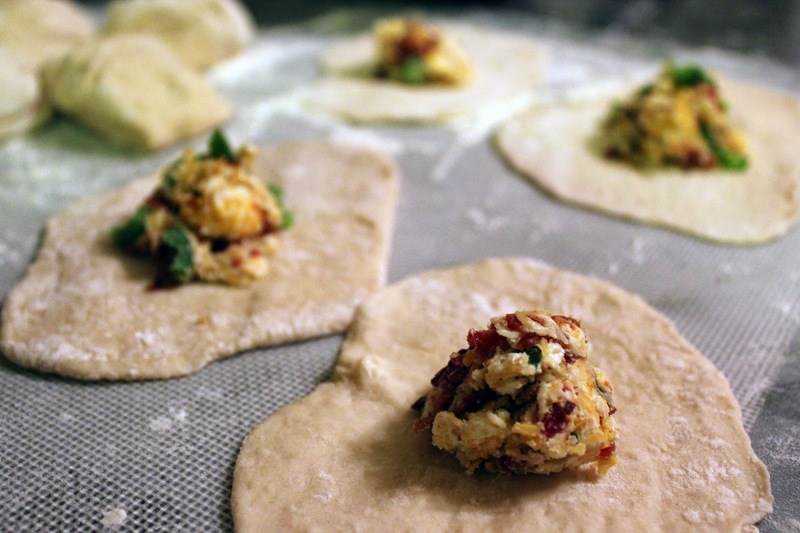 Roll each dough piece (one at a time) into a ball and then flatten it into a circle. Add 1 tablespoon of cheese mixture in the center. Pull each side over the cheese to create a ‘cheese package’, pinching the edges closed. Transfer 3 stuffed dough balls to hot water mixture and allow to set while you prepare the next 3. Remove dough balls from water with a slotted spoon and place on prepared baking sheet. Repeat until all dough balls are on the cookie sheet. Arrange all pretzel balls on parchment so they are not touching. Brush egg wash onto each one and sprinkle with course salt. 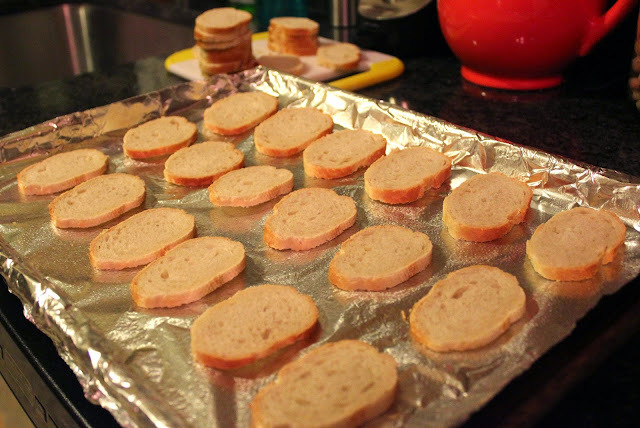 Bake for 8-10 minutes until the tops are browned. 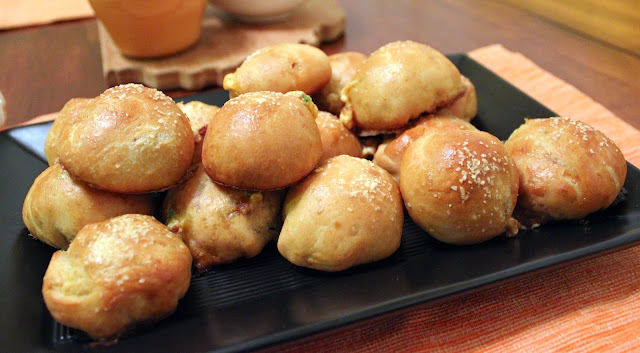 They tasted like warm soft pretzels, with the kick of jalapeno popper in the center. I think we could have used a bit more filling, and tried harder to evenly spread the dough between the top and bottom, but they still turned out pretty great. For a chance to win a $50 Heinen's gift card, leave me a comment below telling me what your favorite Game Day food is to prepare and share. You can also tweet for a second entry (daily) by posting "Game Day is going to be good, thanks to @BiteBuff and @Heinens." I will select the random winner, using random.org, on Friday, January 23rd at noon. Disclosure: I was provided with a $100 gift card to Heinen's to purchase products for this post. 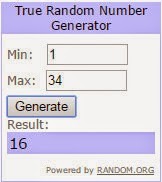 A $50 gift card was provided to give away to one random reader. All opinions stated above are 100% my own. Today marks one month since our wedding. In some ways, it feels like it was just yesterday. We're fully enjoying being "newlyweds," and it still feels odd to use my new name. In other ways, it feels as though the wedding was for-ev-er ago. I think having the holidays immediately after the wedding is throwing me off. As I reflect back on the wedding today, I just wanted to share a post that highlights our fabulous vendors that helped make that day so special. We held the ceremony and reception at Cibreo Privato. 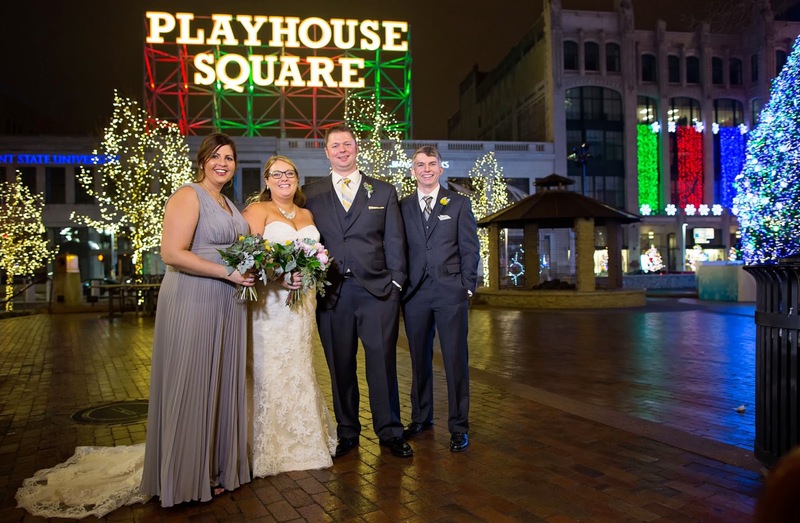 It is the special event space located in PlayhouseSquare, off of their main restaurant, Cibreo Italian Kitchen. The newly remodeled space used to be the 14th Street Theatre, so it has a fantastic sound system, small stage, lighting system, and a large separate bar area with a private entrance. The space has a warm Tuscan-themed atmosphere, and we had to do very little to the space to make it look and feel special for our wedding. White linens are included in the room rental, but I decided to add a jute overlay and ivory lace runner. These, and the wicker chargers, were provided by Event Source. Their showroom is an event planner's dream! They have an overwhelming number of options, and a long list of rental equipment. I was lucky enough to work with my friend, Linley, over there, and the selection process was totally easy and fun! The space, and the additional rentals, captured the rustic, romantic look that I was going for. Under the leadership of GM Greg K. at Cibreo (who was amazing to work with during the planning and execution of our wedding), the staff made my dream wedding come to life in that room. One item that I was unwilling to budge on was that I wanted to use succulents in my bouquet and centerpieces. I'm obsessed with the look of them, and I had to have them. I found Urban Orchid Floral Boutique through a recommendation on Twitter from a Cleveland fashion blogger that I trust. I was familiar with the business, and my meeting with Brandon, the owner, could not have gone smoother. What a sweetheart. He captured my vision immediately, and the arrangements looked even better than I could have imagined on the day of our wedding. We rented the birch centerpiece holders, and they just added to the rustic touches that I had. I also love peonies, and found some new favorites in the yellow billy balls. Lastly, this is a food blog, so of course, I have to talk about the food. Ahh, the food! Cibreo is one of the Driftwood Restaurant Group restaurants (others include Hodge's, Washington Place Bistro, Bin 216, etc.). They also have Driftwood Catering. We wanted to provide passed hors-d'oeuvres during the Cocktail Hour. We actually did the cocktail hour first, before the ceremony, so that our guests could arrive and immediately start enjoying themselves. We had two signature cocktails: The Marshall and The Homer. They were custom crafted by the bar staff at Cibreo, and both were delicious! Cocktail hour food included lobster bisque shooters, pork dumplings, and tuna poppers and hanky pankies that can both be found on the Hodge's restaurant menu. The reception was a plated dinner, with a delicious salad and the option to choose between three entrees. and Hodge's famous French Onion Ravioli (not pictured). It was hands-down the best wedding food that I've ever had. Exactly what I wanted. I already showed you our two cakes from A Cookie and A Cupcake. We're still dreaming about that Salted Caramel cake. The two designs were expertly done, and were certainly memorable. All of the images included above were captured by Peak Moments. David and Dale were such a pleasure to work with, from start to finish. They captured some amazing shots during our engagement shoot and the full day of our wedding. The images are something that we'll treasure forever, and I can't thank them enough for making the experience so relaxed and comfortable. We both weren't sure how we'd feel being in front of the camera. Every single one of our vendors exceeded my (high) expectations. With the exception of our DJ. We used Marino Brothers. They came highly recommended, and we've attended several weddings where they provided the entertainment. Working with the owner, Dave, was a pleasure, but the Lead DJ was rude and pushy from the first time that I spoke with him all the way through our wedding night. We also did not receive all of the contracted services, and had to be saved by Cibreo for some background music at times. I was furious, and had hoped to resolve the issues with Dave after the wedding. After a couple of phone tag calls later, I gave up. He didn't seem interested in hearing my opinion on what happened or resolving the problem. Very disappointing, and they are the only vendor that we used that I would never recommend to another bride. It was fun to reflect back on the day, as we hit our one-month mark. I hope that this is helpful information for any Cleveland bride planning a wedding. From start to finish, each of these vendors was a pleasure to work with, and were competitively priced for the quality we received. The day was almost flawless, and it was everything that I could have hoped for. I had the best three days of my life, surrounded by family and friends and making a memory that will last a lifetime. Right before we left for the holidays, Mr. H and I decided to splurge and celebrate our "one week of marriage" by having a romantic dinner out. One of the first places that comes to mind when we're looking for a special occasion spot is Luca Italian Cuisine. Nestled in the Superior Viaduct (just down West 25th from the main strip of restaurants), it has stunning views of Downtown Cleveland and our bridge system. It's a quiet area, and the restaurant's atmosphere and views just beg for a romantic outing. We've had five good meals here now, and this one did not disappoint. What do you think...I think marriage looks pretty darn good on Mr. H.
Overall, we had a really special meal and were treated very well by their staff. However, the only (minor) disappointment came from our Antipasti course. We'd had the Tartar de Filetto Manzo ($15) at our very first visit, and it had stuck in our memory as the best beef tartar that we've ever had. I've been comparing all others to this version ever since. However, this time, it was missing some of the bright citrus and caper flavors that I remember from the first time. It was still a good tartar, don't get me wrong, but it fell a little short of the high standard that I had held it to. The Whole Grain Crostini served with it was also rock-hard, and way too crunchy for full enjoyment. From the La Pasta section, diners can order a Half or Full portion, depending on whether or not you'll be enjoying it as an entree, or as a shared appetizer. We ordered a half portion of the Vitello Tortelli with veal stuffed tortellini, cream sauce, prosciutto, and asparagus. It was a solid version of a classic pasta combination. For something a little unusual, order their Sacchetti al Tartufo Bianco. I decided to try their Costolleta di Agnello (grilled lamb chop with shallot, port glaze, and a sweet pea risotto) for $32. This dish was exceptional. The flavor and tenderness of the meat was wonderful, and I loved the sweet pea risotto's flavor and texture. I took home over half of it, and it re-heated well. Mr. H also decided to try something new, and he ordered the Milanese di Vitello (breaded veal chop with marinated grilled radicchio, goat cheese, and aged balsamic) for $47. Again, this dish was very good. It was a tad dry in the areas where there wasn't any goat cheese, but the bites with all of the components combined were very good. Pounded out to a thin chop and lightly breaded, it was delicious. This dish was also huge, and we took home quite a bit of the veal chop. It was even enough for us to split the next day. When our server heard that we had just gotten married the weekend before, he surprised us with a complimentary Tiramisu (with candle). That was so thoughtful, and a nice treat at the end of our very decadent meal. It truly felt like a celebration. We were enjoying gorgeous views, delicious food, attentive service, and each other. A special night. That's what Luca can offer. It will continue to be a go-to spot for us when looking for something special in Cleveland. Add garlic and jalapenos, and cook, stirring frequently, until fragrant, about 1 minute. Cover, reduce heat and simmer until quinoa is cooked through, about 25-35 minutes. Top with Sriracha, to taste. I also sauteed some shrimp in 1 Tbsp. olive oil, 1 Tbsp. lime juice, and 1 tsp. Sriracha, and then stirred the shrimp into the quinoa mixture before serving. One tip: If the mixture is looking too wet towards the end of cook time, uncover. This recipe was adapted from Damn Delicious. 2015 To Dine Challenge- The List! Wow, January 1st! A new year. It's hard to believe that another year has passed, but 2014 was a good one. 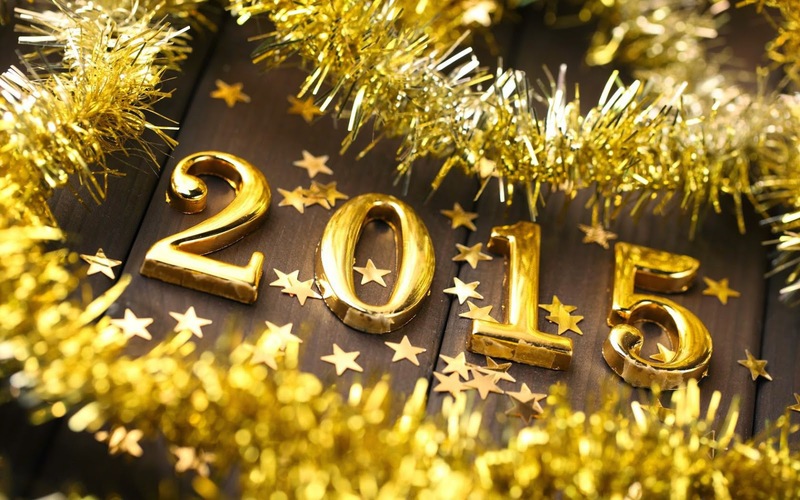 I welcome 2015 with open arms, and I just know that good things are ahead. I hope that you all enjoyed a happy holiday season with family and friends. We sure did, and it was extra-special being a newly married couple. You know what that means, another year...another list of 10 restaurants to challenge myself to dine at over the course of the next twelve months. I asked, and you replied. Almost 40 restaurants were suggested, and we had fun narrowing the list down to just 10. I tried to sprinkle in a little of everything....some new, some old, a little of this, a little of that. I'm pretty pleased with what you guys came up with, and I think that the list looks great for 2015. Over the next twelve months, I'll be dining at these 10 restaurants and posting my reviews. See one that you'd like to join me for? Leave a comment below! Thank you for playing along once again. I enjoy seeing what you all come up with. Happy New Year to you and yours.